As I said, the overall number of cells in the cellset remains the same, but only the cells in the range we specified actually contain data. This ‘filtering’ happens after the query axes have been resolved, as far as I can see, so adding NON EMPTY on Rows for example does not filter out any of the empty rows. If you were using SSRS, however, you could do this filtering at the DataSet level. 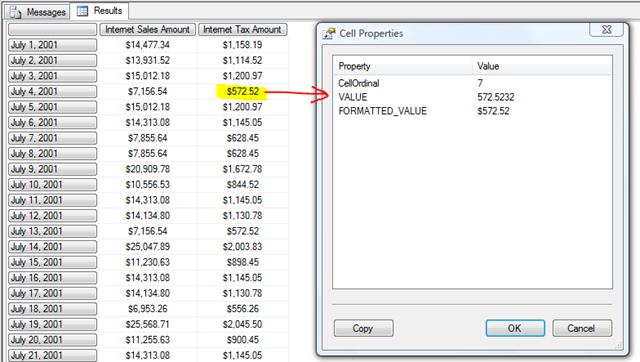 If you look in Profiler you’ll see that these properties have an affect on the amount of work SSAS does at query time. On a cold cache, with no BeginRange and EndRange set, the query scans all of the year partitions in the Internet Sales measure group as you would expect. 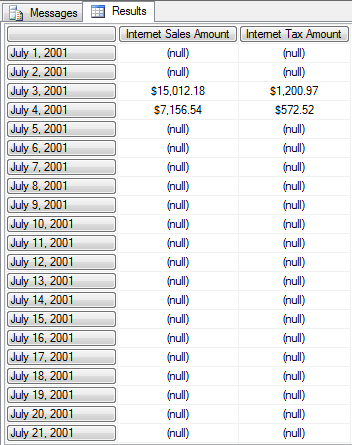 But with BeginRange and EndRange set as above, on a cold cache SSAS only reads data from the 2001 partition. BTW, remember that if you’re experimenting with these connection string properties in SQLMS, when you’re finished you’ll need to either close and reopen SQLMS or set BeginRange=-1 and EndRange=-1 as a result of this bug (which still doesn’t seem to be fixed in SP1). 2:45 Nothing much so far we haven’t seen already. However the toolbars are much easier to see in this video and the first thing pointed out is the list of tables loaded into Gemini listed at the bottom of the screen. Table Tools, with buttons to create relationships between tables and to manage relationships. So far I’m getting a very strong feeling of relational database concepts coming through – ok if the Gemini user is familiar with them (perhaps through Access), but is it asking too much of a user to think in terms of tables and joins? Columns Tools. Can’t see much here, but we saw a bit earlier in the demo that on the far right hand side of the data area it seems you can add new columns onto the end of the table, and the buttons here allow you to manage these columns, delete them, resize them etc. Calculations. Again can’t see much here, but the button at the top says Manual. I wonder if it’s going to give you the option to either automatically apply all your calculations, or only apply them when you press a button (in case calculation takes a long time). View. The options here are Pivot Table and Switch to Excel. I guess the demo is done in some kind of Table view, and we’ll have the option to view the data instead in a pivot table or go to Excel and work with the data there in the way we would with any other external data source. 4:17 The now inevitable OOHHH moment in a Gemini demo where we see 20 million rows of data being manipulated in memory. Of course, though, the amount of data we can work with will not only depend on how much memory we have but also how well it can be compressed. From what I understand of COP databases like Gemini, you get great compression because it only stores the distinct values held in each column; but if your data contains a lot of different values then you won’t be able to compress it as much and you won’t be able to work with as much of it. I think. 4:46 And not wishing to sound like Mr Sceptical, but watching all these demos of sorting and filtering large amounts of data very quickly raises a question in my mind: are all the rows in the table actually sorted and filtered, or does Gemini just do enough sorting and filtering to fill the screen? Finding the top 30 or so rows out of 20 million based on a value is certainly impressive, but it’s not the same as sorting all those 20 million rows. 6:23 The Manage Relationships dialog. Again, very relational and strangely non-visual as well; I’d have expected a graphical representation of the two tables joined, just like you’d get in any other database tool. Maybe it’s not ready yet though. Hmm, again seems more like a SQL expression (a sum/inner join) translated to Excel rather than anything resembling MDX. It does the calculation very quickly although it’s the first time something has been less than instant. 0:25 We’re in Excel now, using a pivot table, but notice that on the right-hand side we have the ‘Gemini task pane’ so perhaps it’s not a regular pivot table? 2:48 Create Relationship dialog. Again it doesn’t seem very graphical, and notice the use of relational database terminology again with the mention of primary keys and foreign keys; for someone who is used to working with databases this is fine, the obvious term to use, but are these concepts we should expect Gemini users to understand? Shouldn’t things be less technical, more user friendly? 2:59 Interesting that creating a relationship takes a few seconds and some crunching to do. I wonder what’s going on here exactly? Cube reprocessing? 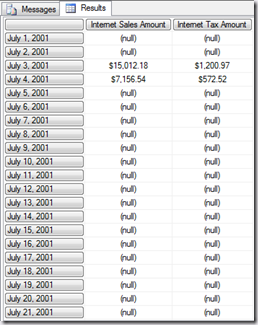 3:43 Show Values As menu option – ok, this is what you get in Excel anyway, but am I right in thinking there are a lot more options here now than are available in 2007? Maybe I’m wrong, but this all seems to be Excel calculations rather than calculations happening in Analysis Services. 8:15 The Excel workbook containing this data is 203MB – interesting, because although Gemini is in-memory, it’s clearly possible to persist the data to disk if it’s being stored inside the workbook somehow. Members belong to different hierarchies in the function. …for the very good reason that we have violated one of the fundamental rules of MDX – a set has to contain members of the same dimensionality, and here we have a set containing Countries and Product Categories. It’s not quite what we wanted, but it’s all the data we need in a single query and we can probably get the user to ignore the All Members, or possibly hide them in the client tool somehow. The only problem with this approach is that it becomes unwieldy the greater the number of different hierarchies we want to display on columns. In this case [Country] is the name of the Country in the report, and if this expression returns False we have a Country name and we’re therefore not looking at the All Member. To get this to work you just need to have a mining model in your SSAS database so you can put it in the FROM clause; it doesn’t matter what it is because it’s going to be ignored. I was able to join the queries on the MEMBER_CAPTION field from [Date]. [Calendar Year], which contained the names of the Years on rows, although it was a struggle to work out how and where to add all the extra opening and closing square brackets that are needed in the RELATE clause! Notice, though, that we can just paste the MDX queries we need in there – usually SHAPE is used with OPENQUERY, but of course even though this is a DMX query we’re staying within the same SSAS database to get the data so that’s not necessary. Not the most elegant solution, of course, but interesting nonetheless. Since other CEP vendors support some kind of OLAP on top of their data (eg SQLStream/Mondrian, Aleri) I wonder if Microsoft have a story for SSAS and CEP? Looks like SSRS will be getting some new stuff – certainly the collaboration features brought in by the 90 Degree Software acquisition look like they’re going to be added to Report Builder. Perhaps we’ll finally see the Officewriter/SSRS functionality too? Gemini will be able to source data from SSRS reports, and SSRS will be able to expose data as ‘data feeds’ (ie have a new RSS/ATOM rendering extension?). On the BI Blog on Monday a new set of Gemini demos were posted; they’re also available on YouTube. They look like the same demos I saw at PASS Europe a few weeks ago and while they don’t show much in the way of different functionality compared to what was shown late last year, I think there are a few interesting points to note. Unfortunately the quality of the picture is so poor you can’t make out much detail on the screen, so I can only really comment on what Donald Farmer (who’s presenting) specifically points out. 0:11 Note that Gemini isn’t built into Excel, it’s an Excel addin. I’m not sure whether it will work in Excel 2007 or only Excel 2010 (or whatever it’s called) but this is significant for another reason: it means that Gemini release cycles are not tied to Office release cycles, so potentially new releases of Gemini can appear reasonably regularly. 0:35 We start off with sourcing data from a data warehouse – probably intentionally, to forestall some of the hostility that was seen when Gemini was first announced, when Gemini was seen as being yet another “you don’t need a data warehouse” type tool. 1:05 Arggh, why can’t I see the buttons on the Data-Cleaning ribbon? It looks like there’s a lot of stuff there, although it might not be all working properly yet. 2:48 You can copy data into Gemini from the clipboard. Note that you don’t seem to be able to link to the data directly in Excel, at least not yet. Donald also mentions that ‘other data sources’ will be supported – it’ll be interesting to see which ones. 3:18 Creating a pivot table. We seem to be back in regular Excel here and out of the Gemini addin, although Donald says that ‘in Gemini we have some cool pivot tables we can handle’. Perhaps what we’re seeing here are Excel 2010 pivot tables. 3:50 Pointing out the inferred relationship between tables. I suspect this relationship was inferred well before this point; we already know you are going to be able to set these relationships up manually. 4:26 Showing data as a percentage of total. There seems to be a big button to do this; are there going to be any other easy calculations available? Where are the calculations taking place, and how are they expressed – in Excel or the underlying Gemini cube? 4:50 New slicer bars – mentioned as a ‘new feature in Excel’, specifically for Gemini but also available for other Excel users. So this must be new generic Excel pivot table, rather than Gemini functionality. This looks really good; I like the way they are aware of each other too, and aware of what data is available, though I wonder how exactly they know whether data is available and how this would work with cubes containing calculations etc. 0:20 Set theme – whoa, so you can apply a theme to an Excel spreadsheet? Hmm, turns out you can already do this. But it is a powerful feature when you want to create a report. 0:30 Publishing to Sharepoint, but notice how Donald mentions that publishing a model containing 20 million rows would take a bit of time. How long exactly? Minutes? Hours? 0:40 The Sharepoint report centre. OK, so we can rate reports with stars, yeah that’s going to be useful… but other ‘social tools for collaboration’ might be interesting. 1:03 Setting a refresh rate. Basically how often the local cube underneath Gemini gets processed, I suppose. How long will a refresh take though? 1:21 Seeing the report in a thin client. This is Excel Services, I think…? This will only make it harder to choose between Excel/Excel Services/Gemini on one hand and SSRS on the other. It would be nice if there was some kind of story linking the two. 2:57 The operations dashboard – again, I wish I could see more detail of what’s on screen. I can see some of the stuff you’d expect, like metrics on CPU usage and query response times. It’s all done in Excel Services again – I wonder if there’s a cube behind it all storing the performance data? 3:46 Upgrading and formalising a popular app. But notice that the option is ‘upgrade to PerformancePoint’…? The focus is on upgrading for better maintenance and management rather than performance; I guess in PerformancePoint you’ve got IT control over the report design. Possibly, when server-side SSAS gets the Gemini storage engine, you’ll be able to push the Gemini cube into an instance of SSAS. But when you’ve done this will you still be able to use the performance metrics dashboard we’ve just seen?